I have recommendation that I would love to see implemented. I would love if I can make a template (12+ Cards ) to import in an existing deck. i am a author of agot2 on octgn .can i help you to improve your program? I think I'm good at the moment, but thanks for the offer! I already wrote myself a tool that disseminates your set.xml file for my program, for when a new pack is added to Octgn. Thank you for this! My internet connection is very shaky at the moment, so I really appreciate the work you have done! I'm glad it's of some use to someone besides myself! Actually, you can sort of do this already. Just start a new deck and create your deck template of 12+ cards and then save it with a name of 'Wall defense module' (or whatever). Now, the next time you want to create a deck around this module, you simply load in the module first and then finish constructing the deck and give that deck it's new name. Oops, re-read your post..you want to basically combine 2 saved decks together. Right now, to do this, you would have to use a text editor...open both deck files and combine them manually. I'll think on it. Nice software, fast, I like it. OCTGN's built in editor is borderline unusable, this is great. Thanks! I'm freely sharing my creation with anyone who may have a similar need to my own. At times, I'm not in a location where I can access the Internet, so ThronesDB and CardgameDB deck builders aren't available to me. 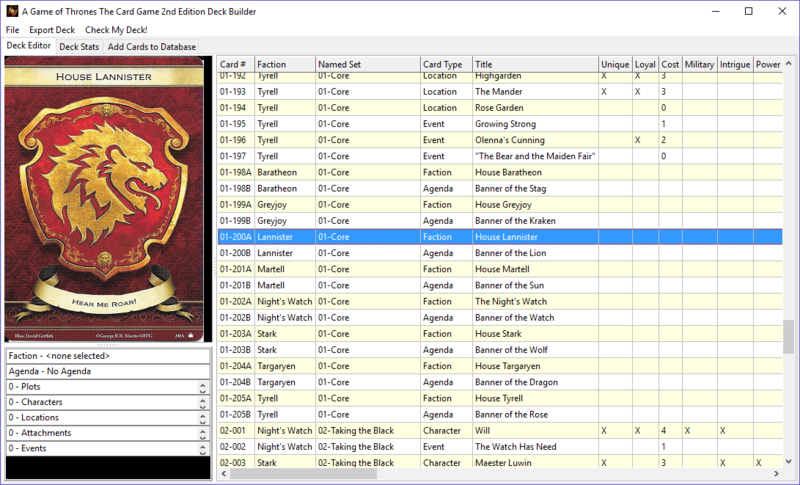 So, I decided to "goof around" and make my own AGoT deck builder that works on Windows OS. If you're interested in trying it out for yourself, I've uploaded it to my Google drive. You can use the following link to access the self-extracting install file. If you do use it, I'd really like to hear any constructive criticism you have about the program. It's version 1.0 right now and I know it's a little 'rough', but I didn't want to make any more changes to it, until I got some feedback from some users. Anyway, enjoy! Hi mate, haven't read the thread so apologies if this has been asked, but is there a way to load these into OCTGN or other websites? The app allows you to both load and save Octgn decks. So when you go to play on Octgn, you simply load in the Octgn decks you created with the app. on a card slot in the lower left. This has been fixed. True Steel has been added! Well everyone, I'm sad to say it, but the True Steel update will be the last to this software. I'm the father of 5 kids, ages 18 through 12, and the oldest is entering college this fall (with the others following close behind). The reality of my financial situation with college looming on the horizon for the oldest means that I have to pare down the number of LCGs I keep up with. Star Wars and Lord of the Rings will be my two LCGs of choice. Star Wars because I fell in love with that universe back in 1977 when I first saw A New Hope as a 5 yr. old kid, and LotR because it's cooperative as well as solo and I don't have to keep up with it (I can buy packs as I have the capital). The collection is in excellent condition - barely played. The only thing "missing" is one set of rulebooks, as I gave them to a friend to help in promoting the game. I'm OCD about my games collections, so I can assure you, that everything is in virtually mint condition. Thanks for the effort, it was truly appreciated!